This topic contains 8 replies, has 3 voices, and was last updated by Fong 2 years, 1 month ago. In the daily sadhana (http://www.dorjeshugden.org/practice/diamond-path-a-daily-sadhana-of-dorje-shugden) there is something called Torma Offering. I read more about it. Can i read the prayer without doing the physical offering? Dear Shunsuke Takahashi, it is possible to recite the prayers without doing the physical offering, however such action is usually reserved for those who have attained great meditational stability. For regular practitioners, it is always advisable to have a physical offering set up on the altar as it is also a great and easy way for us to collect merits by making offerings to the Buddhas daily. It’s permissible to offer an air tight jar filled with cookies/ biscuits on your altar. You can change the offerings weekly or monthly according to your liking. Hope this helps. I remember once someone informed that reciting the torma offering prayer without physical tormas is a no no. So, if I have recited the offering prayers thus do I have to do any purification as I seemed to have offered nothing to the Buddhas? I do not think that any purification practice for this particular issue is necessary, but that being said, doing daily purification practice is an important component in our daily prayers as we are sure to have conducted transgression everyday no matter how careful we are. Daily purification help us so the negative karma collected daily do not multiply and if we practice by applying sincerely the 4 opponent powers, then we can even burn out the negative seeds, thus purifying negative karma. Now that you know, then either skip through the Torma Offering prayer section, or you can immediately place offerings on your altar. It is not ‘wrong’ per say to recite without torma offerings, but it is inauspicious to not have the tormas when the recitation is being made. Auspicious days would be Wesak Day, Dharma cakra day, your Guru’s birthday or paranirvana day (if this incarnation has entered clear light), depending on which lineage you belong to, then the paranirvana day of your lineage gurus will also be considered as auspicious days to make offerings. You can also make abundant offerings after the completion of a retreat or after attending a Dharma teaching or completion of a Dharma learning course in your centre, these are also considered as auspicious days. So, I guess, at the end of the day we should just recite the long Vajrasattva mantra 22 times before we retire for the day as I read somewhere that reciting Vajrasattva purifies the daily negative karma before it can multiply overnight. Thank you for sharing on the details on what we can do for torma offerings prayers. I normally skip the torma offerings prayer as I do not really know what type of torma to do & do not have any torma offerings. 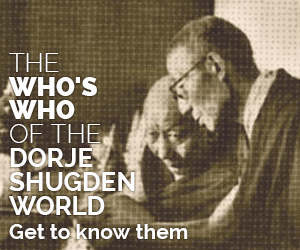 For the torma, do you have any guideline on what is the traditional torma that we can do for Dorje Shugden? Here is an example of traditional tormas to Dorje Shugden as well as the yidam. As you can see, traditional tormas are extremely intricate, requiring both skill and time. Kyabje Zong Rinpoche was truly skillful and compassionate to allow modern day practitioners to make offerings of biscuits and cakes in place of such traditonal tormas, thus allowing us to collect the bounteous merits from the ritual of torma offerings despite our busy schedules. Thank you Beng Kooi for the beautiful picture of how the traditional torma is like. It is just so intricate. It is the perfect mix between modern and traditional. However, if we are not able to do the traditional offerings of such, what we can do is to buy some biscuits and snacks to offer up as the torma offering.